Disclosure: I was not compensated in any way for this post or this giveaway. I chose the items I love, and am giving them to you, because I love winning things, and these are fun things to win! Regardless of sponsorship or connections all opinions on this blog are always mine, and are usually brutally honest. 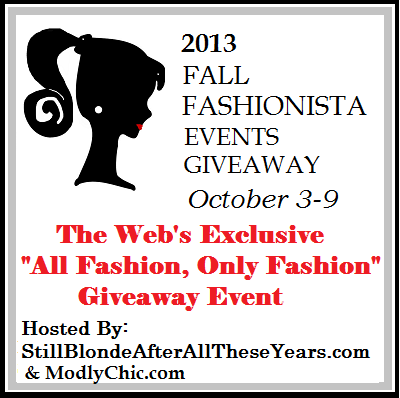 The Fall Fashionista Giveaway Event is hosted by The Chief Blonde at Still Blonde After All These Years http://stillblondeafteralltheseyears.com and Katy from ModlyChic http://www.modlychic.com/. K Squared Glamour http://www.ksquaredglamour.org/ is our co-host! All Fashion! Only FASHION event! Largest Fashion Giveaway event on the internet with $26,000+ in prizes, 100+ participating blogs and 3/4 million entries. Each individual blog has a minimum of $125 prize! My dear wonderful readers. I am late with this post due to an injury to my back. I moved a couch at the beginning of the week, slipped/injured/or pinched a nerve, we’re not sure yet, but I was in so much pain they’ve sent me home on morphine, and I’m not quite myself. Hopefully we’ll find the cause and a useful treatment soon, and the morphine won’t make me quite so loopy. In the meantime, I do have a fabulous giveaway for you all, and I have been preparing it for months. I hope you like it. My fabulous prize for this year is a Guess Bag, a super secretive Prize Candle with a guaranteed jewelry gift, and just in case you don’t like the jewelry in there, I have a beautiful ring that is worth over $200 to sweeten the pot. I hope that a loyal blogger wins, and I encourage you to check out all the other fabulous giveaways in this event! Just a final warning. I have extended my personal giveaway by a few days to make up for my late posting. The official end-date of the Fall Fashionista Event is the 9th so get your entries in soon! I’m most excited about the Guess bag! I am most excited about the ring! I am most excited about the Guess bag. I’ve never owned one before and am certainly due. Thank you. And i hope you feel better soon. I love cool rings, so I’m excited about either of the rings. Tough choices! I’m excited about the bag. I’m excited about the Guess bag and would love to win gift certificates for Christmas. Thanks. Most excited about the super secretive Prize Candle because it could hold something wonderful & I like a good surprise! 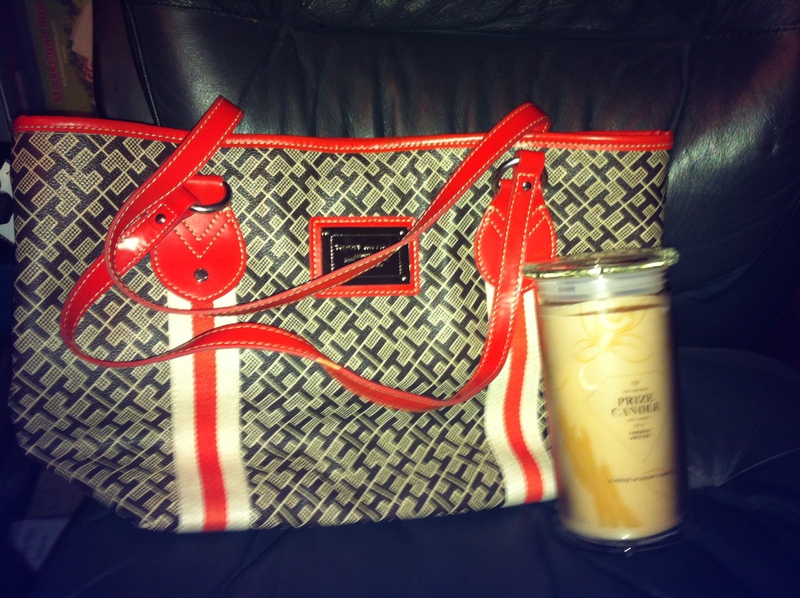 The Guess bag is really cool, (but I do like candles as well). I think gift baskets of all sorts of things, from beauty products to food or candy would be great future prizes. This would be my first designer bag! I am most excited about the candle. I’m excited about that Guess bag! I’m excited about the guess bag! I am most excited about the Guess bag. love rings. All the prizes sound wonderful. Thanks for the chance to win. The bag of course but the candle is awesome too! I like the candle…and in the future I’m always a Paypal or Amazon contest fan. I love them all!!! Most excited about candles because I love candles!!! I am excited about the prize candle. I am most excited about the Guess Bag! I’m most excited about the beautiful Guess bag. I am most excited about the prize candle. I love the Guess Bag the most and am very excited. About your injury, if they send you to Physical Therapy call around and get someone who is either an orthopedic specialist (they have specialists in PT) or make sure the group is very familiar with back injuries. It’s nothing to mess around with. I’m most excited about the purse. I’m thinking the Guess bag is what I am most excited over. As fun as the jewelry is, my fingers are fat and they wouldn’t fit:-( Bummer, right? I like the prize candle. The prize candle sounds interesting- I like surprises. I am most excited about the secretive candle prize. Im excited about the Guess bag. I like the guess bag but the candles are fantastic. I am excited about the Guess bag, I could use a purse for sure! I’d love to win the candle. I love candles and I’ve seen so many bags in this hop that at this point the candle is way more exciting. I’d love to see more giveaways for pet products and dog toys. Also for non-fiction books and plus-size clothing. Thanks for the giveaway. I’m excited about the Guess bag the most. I like them all! But if I had to choose, I would say the ring has me intrigued! This is my comment for the grand prize entry because I don’t reside in the US. I love the mystery of the candle …. hope you feel better really soon. I can feel for you, I’ve had back problems for years all because I lifted a TV the wrong way. I most excited about the Guess bag! I’m excited about the candle! i would like more clothing giveaways, i always need clothes. I am most excited about the bag! I’d love to have the diamond candle, only because I’ve been hearing so much about them. I’m excited about it all, but especially the the bag! Who doesn’t love a new handbag?! I am excited about the mystery ring, but the Guess bag is super cute! Hope you get to feeling better! I am most excited about the candle! I have a collection of Diamond Candles, but I have never heard of Surprise Candle before. I have to say that I’m addicted to handbags so that’s what I’m most excited about, but I think the whole package is exciting! I hope you feel better soon! I love handbags, so the Guess Bag, but all great prizes. Feel better soon! I really want the Guess bag. Hard to decide – I love them all! You can never have to many bags but I love a surprise, so the candle it is. I hope you heal soon – back injuries are so very troublesome. I am most excited about the candle, because it’s fun! The Prize Candle is so intriguing! I am excited about the prize candle – even if the jewelry’s worth basically nothing I love the surprise! I am excited about the mystery ring! I’m excited for the ring and the candle. the candle!! thank u soo much! I am excited about the guess bag. I can always use another bag! I’m most excited about the guess bag!! I love it!! I’m really excited about that prize candle. The bag and the ring! i would love the Guess purse!!! Excited about the Guess bag, but they are all great prizes. Thank you so much and I do hope that you heal us soon. I am most excited about the Guess bag. I love it! As for what I would like to see more of in giveaways? I’m not picky. I love it all. i’M MOST EXCITED ABOUT THE gUESS BAG. tHANKS! I like prize candle too. I’m really excited about the Guess Bag! I hope you feel better. I feel your pain, as I lifted too many heavy boxes on a recent move. I like the Guess bag. Sorry to hear you got hurt. Hope they figure out what happened and you feel better soon! I really like the purse it’s super cute. I am a jewelry and bag nut. Love the orange on the bag. Very interested to know about the candle. I have heard of the jewelry candles but never had one. Hello, I’m most excited about the Guess bag. Thanks for a great giveaway! i’m most excited about the candle and jewelry. I prefer the gift cards type prizes to fashionable/modern brands. So sorry to hear about your setback. I hope you feel better soon! And thank you for this fantastic giveaway! I’m most excited about the Guess Bag. Thanks for the giveaway! I am most excited about the candle…and the ring 🙂 I love surprises. I truly hope your back gets better soon! Awe, I’m so sorry to hear about your back. I know all to well about that issue (I have degenerative disc disease, herniated discs, nerve damage and more, so not fun). I really hope that you’re able to fully recover and it’s a fast and not so sore one. As far as future giveaways, I would say maybe gift cards, paypal, amazon. Hope your back gets better soon! I’ve always wanted to try those candles. I think the prize candle is cool. I love candles anyway and having jewelry in it is a bonus. I’m looking forward to the purse and the ring. I can’t decide on just one! Hard to choose which prize I am most excited about. I have been wanting a Jewelry Candle for months but that Guess Bag is gorgeous! I’m excited about all of it , but I’m excited about the Guess bag the most. I’m excited about the prize candle. I am excited about the super secretive Prize Candle ! Ouch! Hope you’re feeling better soon. The prize that I’m most excited about is the candle, because nicely scented candles and surprises are two of my favorite things (and jewelry’s not bad either!). I’m most excited about the candle! I am really excited about the Guess Bag. I am most excited about the candle because I am such a candle lover! Sorry to hear about your back! I am most excited about the gorgeous bag. I am excited about that bag! I’m excited about the prize candle. I’ve never had an opportunity to try one! I’m most excited about the Guess bag. Thanks. I love the Guess bag!! I’m excited about the bag! It’s super cute! I LOVE candles but super excited about the bag! I’m most excited about the prize candle! As for future prizes, I always love the chance to get a new bag! I’m most excited about the Guess bag; I’d love to give that to my niece for Christmas. I am most excited by the ring. I hope you feel better! I can not find medicalsoup fans on Facebook? I would be most excited to win the candle, though they are all great prizes. I have had back issues for years now, the pain is terrible when it acts up, sorry to hear you are dealing with that right now. Feel better. I am excited about the $200 ring. Sorry to read about your injury. Hope you feel better quickly!